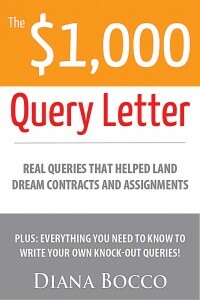 Recently, I discovered a terrific new Writer’s Digest ebook, The $1,000 Query Letter: Real Queries That Helped Land Dream Contracts and Assignments, when author Diana Bocco, interviewed me about how I pitched Money magazine. The book, which sprung from an article she wrote for Writer’s Digest magazine, offers actual pitches used in a wide variety of niches–from magazines to horror novels and literary fiction–to sell projects, and interviews with the queries’ authors. We all know how much agonizing can go into pitching, so I found it very useful to get a glimpse at the thinking process that went into each missive, especially in genres I’d like to try. Diana has written a number of other ebook titles, including some self-published ones, in addition to contributing to many publications on topics such as travel and health and wellness. Among her ebook titles: How They Did It: 25 bloggers, authors and writers share all their secrets about earning a living and how you can do it to, The Ten Habits of Successful Writers, and Vegetarian New York City. She’s also written the horror titles Don’t Turn the Lights On, and The Bleeding Trees. I was curious about how she writes ebooks–and know that many of you are, too–and she was nice enough to do an email interview from Thailand, where she’s living as an expat. Whether you’re a professional writer or an expert in your field who wants to make some money by publishing an ebook on what you know, Diana’s advice will save you a lot of research time. How did you get into publishing ebooks? And how did your pitch to Writer’s Digest morph from an article to an ebook? I’ve always been interested in ebooks. In fact, I teach an online workshop on how to write and publish ebooks. When you travel a lot, you can’t really afford to cart books around everywhere, so my Kindle became my best friend. The transition from the WD article to an ebook felt really natural for me. 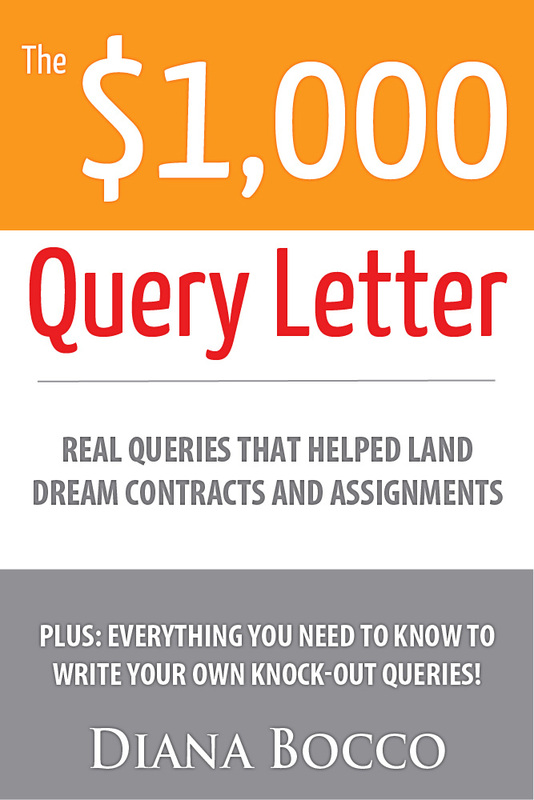 Once I started interviewing writers and reading their query letters, I realized they had a lot more to say than I could fit in an article. I thought, “Hey, this would make a great ebook!” And that was it. I’m always coming up with new ideas for ebooks. I actually keep a list of ebook ideas. Last time I checked, I had over 40 titles waiting to be written! How did you learn how to prepare ebooks? How much time does it take, all told, to write and format an ebook? I’m a fast writer. My first drafts tend to be very clean and I usually don’t have to do a lot of rewriting/editing to get the ebooks (or my articles) where I want them to be. I do have an editor/proofreader who goes over the copy to make sure I haven’t missed anything. Formatting is a breeze. There are actually a number of programs, such as Calibre and Mobipocket, that you can use to format your ebooks. Takes seconds to do it. How did you get professional covers designed? And how much does that usually cost. You can find cover designers for all kinds of prices. Anywhere from $25 to over $500. Googling “ebook cover design” will get you lots of potential options. Another route (especially for fiction) is going over to Deviant Art and finding a piece of art you like, then contacting the artist to see if you can agree on a price. For simple covers, you can get a picture from istockphoto.com and use that. A couple of my covers cost just a few dollars to produce because I found the right (read: cheap) images. What ebooks platform do you prefer? I only self-publish through Amazon. This is because I enroll my ebooks in their Kindle Select program, which requires exclusivity. In exchange, you get a number of perks that help increase your visibility and sales. I know other writers choose not to be part of Select and also publish through Smashwords and other platforms, but my experience with Select has been great, so I’m staying with them for now. What is the difference for you, financially, when you work with an established publisher for an ebook and when you self publish it? I actually make a lot more money with my self-published ebooks. With Amazon, you receive 70 percent of your cover price as royalties. Ebook publishers usually pay 40 percent royalties. [Editor’s note: Bocco’s ebooks sell for $2.99 a download on Amazon]. Of course, if you’re going to self-publish, you need to do it right: get a professional cover, pay an editor, set up a nice website to help you promote your books. When you self-publish, you have to embrace all the roles: writer, publisher, publicist. If you’re willing to do that, then the results can be great. I still work with established publishers because you can reach a different type of audience. I think it makes sense to combine both options, because they each offer different benefits. What should would-be ebook writers know about publicizing their work? What strategies have worked for you? The best way to sell more ebooks? Write another one. Seriously. The more ebooks you have out there, the more you will sell. Sure, you can spend some time spreading the word, writing guest posts, talking about your ebook. But nothing works better than publishing more ebooks because this causes a sort of snowball effect. Readers who discover one of your ebooks will buy others. And the more ebooks you have out there, the more chances readers will discover you. I know writers who are putting out 20-30 short ebooks a year. It sounds like a lot, but it’s very doable once you find your rhythm.